We're pleased to have David Almond join us to share more about his latest novel A SONG FOR ELLA GREY. 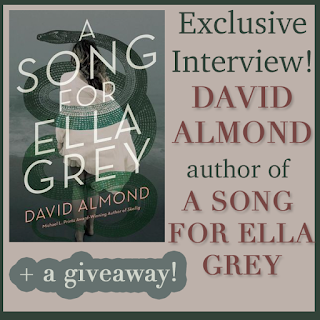 We are also giving away a copy of A SONG FOR ELLA GREY, so make sure to enter in the Rafflecopter form below. David, what was your inspiration for writing A SONG FOR ELLA GREY? So many things. The myth of Orpheus and Eurydice itself, which has haunted me for many years. It’s one of the world’s great stories, first told thousands of years ago, and told and retold ever since in the form of music, song, poetry, film, drama, dance, fiction. It seemed time to create my own retelling, and to set it among ordinary modern teenagers in an ordinary modern world. The book is also inspired by the landscape of the place in which I live: the north east of England with its beautiful beaches; the city of Newcastle where I was born. It’s also influenced by modern young people, with their passions and pains, their care for each other, their love of music, their yearning to understand themselves and the world. 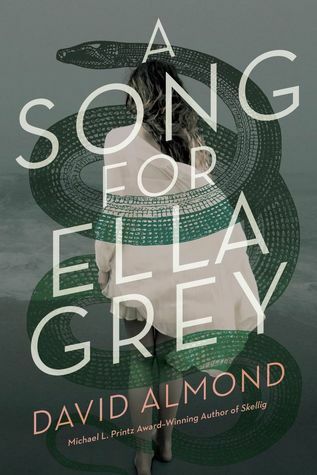 What is your favorite thing about A SONG FOR ELLA GREY? My favorite thing was writing the series of crucial moments: Ella running from the classroom to Orpheus; Ella hearing his voice for the first time (through a cellphone); Orpheus singing on the beach as the birds come from the sky and the seals come from the sea; the ‘wedding’; Ella’s sudden death; Orpheus’ journey through the terrifying darkness to the underworld; his return with Ella just behind; his own death. The writing of every book is different, and every book should move the writer a little further forward in his/her artistic journey. At times, writing Ella Grey, I felt a new kind of pace and freedom. And at times, I felt again that the writing is at its best when the writer seems not to be there at all, when the words, rhythms and narrative have their own organic force. This was appropriate, of course, in telling this tale, which is about the power of song and music to pour through us all and to change and inspire us all. I wrote the book from the point of view of Claire, a teenage girl. Of course, I am not a teenage girl! But all writing involves an imaginative leap into other bodies, minds, imaginations. There’s good advice there. Don’t always write as yourself. Become someone else. Write from their point of view. Weirdly, this can be very liberating. The character you become helps to make the writerly decisions, to move the story forward. David Almond, recipient of the prestigious Hans Christian Andersen Award, a Printz Honor for Skellig, and the Printz Award for Kit’s Wilderness, has crafted an enchanting modern take on the myth of Orpheus and Eurydice. Written in lyrical prose, this novel for fans of epic romances and mythology retellings explores themes of love, loss, fate, and destiny set against the dramatic and diverse backdrop of Northern England. Claire and Ella and their friends are bound by ties so strong they seem unbreakable. Then the strange and handsome Orpheus strolls onto the beach, and he sings them all into an astonishing new understanding of themselves. Ella is caught the hardest, fastest, deepest—and Claire feels the pain of looking on. Raw, emotional, lyrical, funny, and true, A Song for Ella Grey is a tale of modern teenagers and their joys, troubles, and desires. It’s a story of first love, a love that draws on ancient mythic forces. A love that leads Ella, Orpheus, and Claire to the gates of Death and beyond. Have you had a chance to read A SONG FOR ELLA GREY yet? Do you find the writing of every book to be different? Do you become someone else when you write? What a great cover! The book sounds so interesting. & I love when you host author interviews.